"This recipe is simple to make, yet impressive. The marinade gives the fish a sweet taste that my family goes nuts for! If it's too cold out to grill it, you also may broil it." In a large self-closing plastic bag, combine ginger, garlic, soy sauce, orange juice, honey, and green onion; mix well. Place salmon in bag and seal tightly. Turn bag gently to distribute marinade. Refrigerate for 15 to 30 minutes. 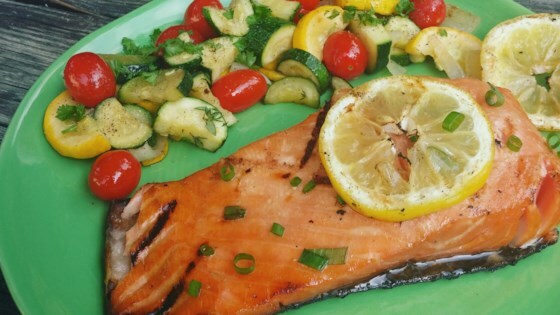 Remove salmon from marinade, shake off excess, and discard remaining marinade. Grill for 12 to 15 minutes per inch of thickness, or until the fish flakes easily with a fork. See how to make marinated grilled salmon with a sassy spicy sauce. It wasn't what I was expecting. I think the soy dried the fish out and made it too salty. I even used the reduced sodium sauce. This was the best Salmon I have ever eaten! A+++ We ended up marinating for about 5 hours and its winter in WI so we baked it for about 15-20 min. This is one for the Recipe Box. I used this marinate just the way it is presented; it was simple and very good. I cooked the fillet on a cedar plank on a grill, adding just a hint of smoke flavor. This one is a keeper. Salmon was moist and juicy, baked it instead of grilled but still the result was pleasant a nice sweet flavor but the ginger flavor was lost in the sweetness, I recommend more ginger be added. So good! I baked at 425 for 20 minutes then broiled for 5. Fantastic. Would pay money to eat that and then go brag to my friends about the wonderful meal I had. We let this marinade overnight, using red onion instead of the green, and it turned out superb! Has already become a favorite in our house! !